The rur­al climbs of Kyrgyz­stan are legendary. They are also under threat. Brett Wilson has been work­ing as part of an inter­na­tion­al effort to secure the future of Cent­ral Asia’s unique nat­ive flora. 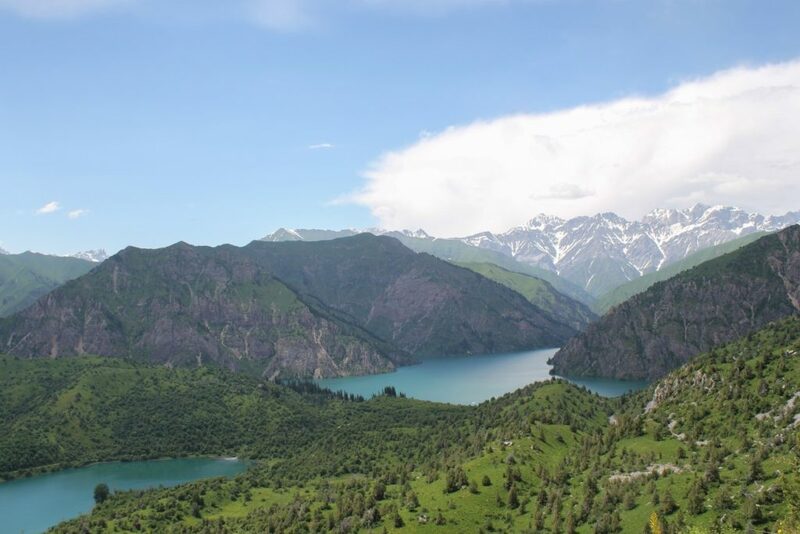 One of many stun­ning views encountered in Kyrgyzstan’s Sary-Chelek Bio­sphere Reserve. Cent­ral Asia was once the focus of trade across the world. The Silk Road ran from China across into Europe span­ning the moun­tains and val­leys of Asia’s cent­ral region. How­ever, as this region became absorbed into the USSR, its links to the West­ern world were broken and the trans­fer of know­ledge regard­ing this region’s biod­iversity was, unfor­tu­nately, lim­ited due to rising ten­sions between coun­tries. Today, after the break­up of the Soviet Uni­on and the inde­pend­ence of coun­tries such as Kyrgyz­stan and Kaza­kh­stan, the sci­entif­ic and envir­on­ment­al depart­ments of these coun­tries are grow­ing and the amaz­ing spe­cies diversity that these areas hold is becom­ing appar­ent. I worked in the Repub­lic of Kyrgyz­stan in one of the biod­iversity hot­spots of the world, the wal­nut-fruit forest. These forests are thought to be the ori­gin of an incred­ible vari­ety of fruits and nuts such as apples, pears, apricots, wal­nuts, and pista­chio nuts as well as a range of flowers includ­ing tulips. Due to the his­tory of these coun­tries, little research has been car­ried out in these forests espe­cially with regard to some of the more Endangered spe­cies. The land­scapes where these spe­cies are found are heav­ily util­ised by the loc­al human pop­u­la­tion. The resources gathered from these forests have helped sup­port loc­al com­munit­ies for thou­sands of years and con­tin­ue to be an excep­tion­ally import­ant part of loc­al cul­ture and life. 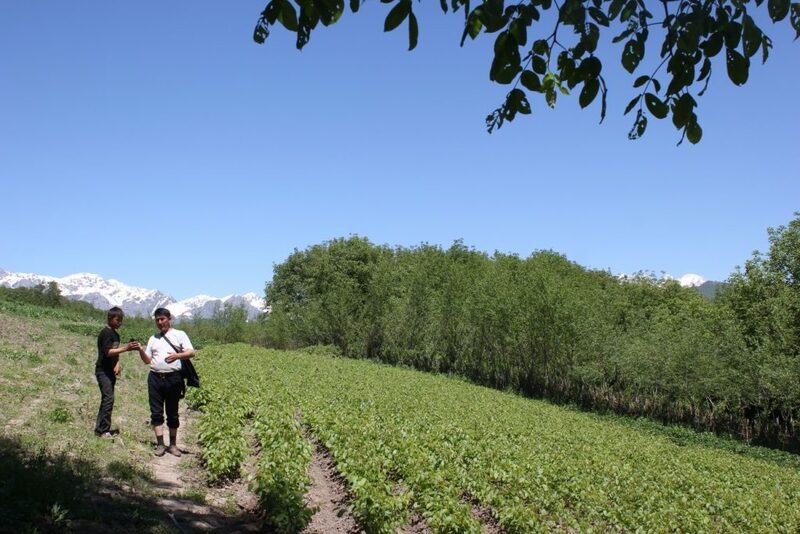 Farm­ing and forest are nev­er far apart in the Kyrgyz land­scape. The forest eco­sys­tem, how­ever, is under pres­sure due to over­har­vest­ing of resources and excess­ive live­stock graz­ing with­in the forest land­scape. This is greatly lim­it­ing the regen­er­a­tion capa­city of the forest and may mean that these areas are not sus­tained for future gen­er­a­tions. As the loc­al pop­u­la­tions con­tin­ue to increase, this prob­lem also escal­ates. The remain­ing hab­it­at frag­ments are becom­ing more dam­aged and pop­u­la­tions of many fruits and nuts are declin­ing dra­mat­ic­ally. Numer­ous spe­cies loc­ated in these forests have been iden­ti­fied as threatened and in need of urgent con­ser­va­tion action. How­ever, lim­ited inform­a­tion on these forest sys­tems and the spe­cies with­in greatly inhib­its the tar­get­ing and there­fore the effect­ive­ness of any action planned. 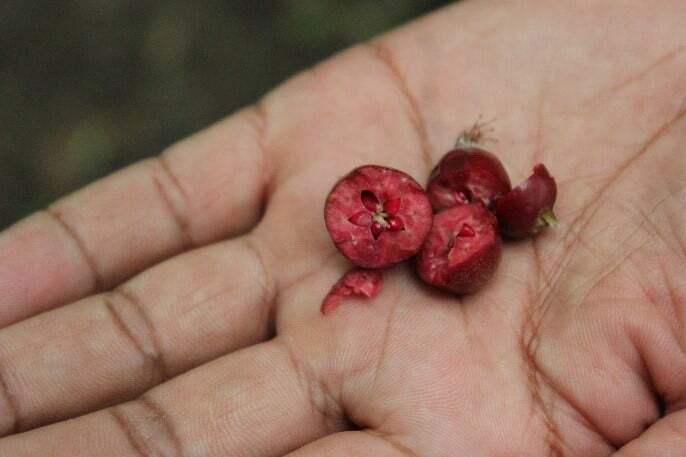 I stud­ied the apple spe­cies Malus niedzwet­zky­ana, already on the Endangered list, with the hope of redu­cing the know­ledge gaps sur­round­ing threats to this spe­cies and its eco­logy. The apple is unique as it has a red pig­ment which per­meates through its leaves, flowers and fruit leav­ing red-tinged leaves, a deep red fruit from its skin through to its flesh, and pink flowers. This red pig­ment is a type of antho­cy­an­in which has been shown to have bene­fi­cial health prop­er­ties, with anti-inflam­mat­ory and anti-vir­al being two of the most sig­ni­fic­ant. Its unique genet­ic makeup high­lights it as a crit­ic­al spe­cies to pro­tect as it has import­ant poten­tial use in devel­op­ing new apple vari­et­ies. The red fruit of the Niedzwetzky’s apple tree. The unique pig­ment­a­tion of this spe­cies makes it iden­ti­fi­able against oth­er apple spe­cies. Work­ing with Fauna and Flora Inter­na­tion­al and Imper­i­al Col­lege Lon­don, I col­lec­ted data in four forest frag­ments that were known to be strong­holds of the wal­nut-fruit forest eco­sys­tem and where loc­al com­munit­ies were will­ing to provide sup­port to con­ser­va­tion prac­tices. Dur­ing my trip, I loc­ated around 150 indi­vidu­als [the largest data­set known glob­ally] and recor­ded the extent of threats from live­stock graz­ing and fire­wood col­lec­tion across these areas. I also explored the basic eco­logy of the spe­cies and developed a spe­cies dis­tri­bu­tion mod­el to invest­ig­ate his­tor­ic­al forest cov­er and try to devel­op evid­ence for past hab­it­at loss. By gath­er­ing this inform­a­tion, I have been able to con­trib­ute to the pro­tec­tion of an icon­ic Cent­ral Asi­an land­scape and change the fate of one of its more unique spe­cies. My research high­lighted that all forest frag­ments were greatly affected by humans. How­ever, in the sites of Sary-Chelek Bio­sphere Reserve and Kara-Alma Forestry Unit, there was poten­tial to strengthen excep­tion­ally stressed pop­u­la­tions through sap­ling plant­ing pro­jects. I iden­ti­fied south-west slopes with rel­at­ively open can­opy as good areas to plant sap­lings. Using the spe­cies dis­tri­bu­tion mod­el, I provided evid­ence that the his­tor­ic­al range of this spe­cies was much lar­ger than its cur­rent range, high­light­ing the effect of hab­it­at loss. This affects not only Malus niedzwet­zky­ana but the whole com­munity found in the wal­nut-fruit forests. By gath­er­ing this inform­a­tion, I have been able to con­trib­ute to the pro­tec­tion of an icon­ic Cent­ral Asi­an land­scape and change the fate of one of its more unique spe­cies. This work is crit­ic­al in design­ing the con­ser­va­tion actions that will pro­tect this spe­cies in the future and the com­munity in which it grows. To have been able to explore a scarcely known corner of the world, walk­ing through the forests where few have been before, was a truly remark­able exper­i­ence. The con­trast of Rus­si­an and Turk­ish influ­ences along­side the unique tra­di­tions of the region make this a ver­it­able cul­tur­al melt­ing pot. This region, hid­den from the world I grew up in, is full of incred­ible people, excit­ing nature, and won­der­ful oppor­tun­it­ies, a land which I hope the rest of the world will come to appre­ci­ate as I have done. Brett Wilson car­ried out his research with the sup­port of Fauna and Flora Inter­na­tion­al, The Roy­al Botan­ic Gar­dens, Kew, and Imper­i­al Col­lege Lon­don, with fund­ing from the Glob­al Trees Cam­paign. His interests lie in tree con­ser­va­tion research and he is cur­rently an intern at Botan­ic Gar­dens Con­ser­va­tion Inter­na­tion­al where he works on pro­tect­ing tree spe­cies world­wide. All pho­to­graphy by the author.